Garlic is world-renowned for its place in sauces, soups and other dishes. It has also gained a great deal of attention for its potential to fight infection, reduce cholesterol and blood pressure, and otherwise protect the body when taken in moderation. Garlic tea is a perfect vehicle for garlic's benefits. According to Drugs.com, garlic has been used for centuries to disinfect wounds, combat infections and even treat tuberculosis using an inhaled version of garlic -- perhaps garlic tea steam. Garlic juice and oil extracts inhibit the growth of many bacteria, viruses and fungi, including candida, E. coli, Staphylococcus and Streptococcus. The antibacterial and antifungal activity is due to allicin, a compound within garlic. To release allicin, garlic must be crushed, cut or chewed while raw. Garlic tea may have heart-protective properties. One promising 1996 study from Memorial Hospital of Rhode Island gave aged garlic extract to 41 men with high cholesterol, and found it lowered total serum cholesterol by 6 to 7 percent over the course of the study. The garlic extract also lowered LDL, the "bad cholesterol" by 4 percent and blood pressure by 5.5 percent. Brewing a cup of garlic tea can provide this heart-healthy food in its real form. Garlic contains antioxidants, as well as allicin, the compound behind many of garlic's health benefits. But in 2003, the scientific journal ''Phytotherapy Research'' published a literature review from the All India Institute of Medical Sciences that casts a potential shadow on garlic. The review notes although garlic is used to address a variety of ailments including cancer, infections and hepatic function, it also contains compounds that can harm the heart, liver and kidneys if ingested in large doses. 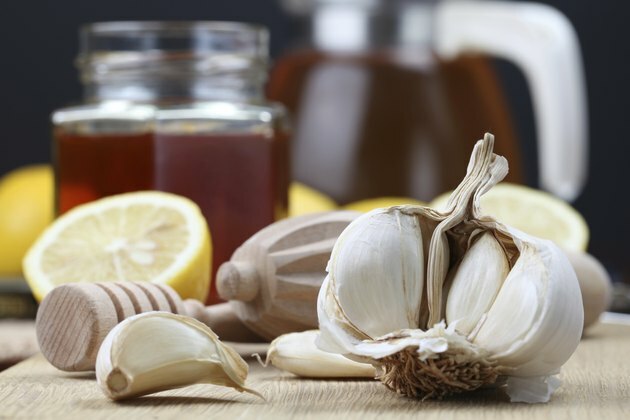 Some garlic teas include other ingredients like honey and lemon. To make garlic tea, first chop the garlic to release allicin. Bring 1 cup of water to a boil, then turn off the heat. Add one to three cloves of garlic, depending on your preference. If desired, add lemon juice and honey to taste. Oregon State University notes that allicin is inactivated by cooking, but chopping and letting the garlic stand for at least 10 minutes before exposing to heat can help preserve allicin. What Kind of Tea Helps a Sinus Infection?